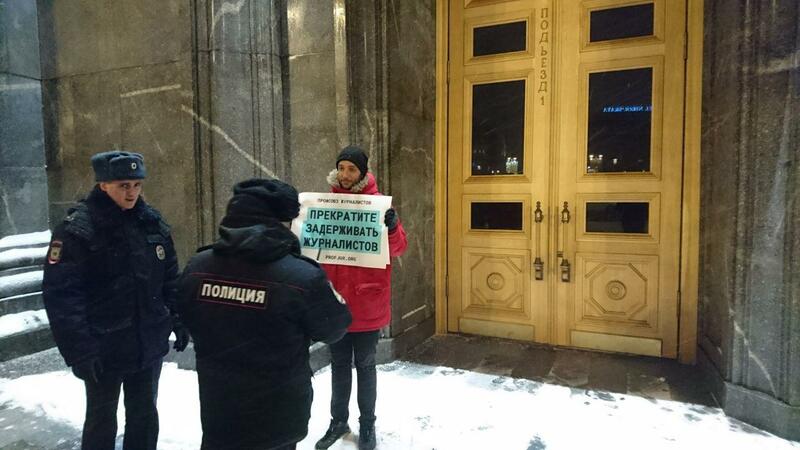 Pavel Nikulin, a member of the independent Journalists’ and Media Workers’ Union, pickets the headquarters of Russia's domestic security agency FSB, to protest against a colleague's detention. Photo by Igor Yasin, used with permission. When state security officers arrived at his home early in the morning of January 31, Russian journalist Pavel Nikulin learned firsthand that punishment is not always timely. Nikulin, a co-chair of the Journalists and Media Workers Union in Russia, was visited by members of the FSB, one of Russia’s security services, who searched his apartment and seized several of Nikulin's possessions including laptops, documents and copies of his independent magazine, Moloko Plus. 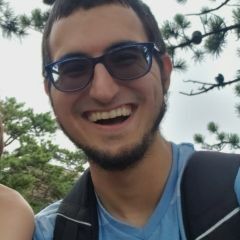 Posting on his channel on Telegram, a widely-used messenger service in Russia, Nikulin told his subscribers that the search was related to Article 205.3 of Russia's criminal code, a statute that deals with “undergoing training for the purpose of committing terrorist activity.” This was confirmed by a lawyer from Open Russia, an organization dedicated to the promotion of democracy and human rights in the Russian Federation. У меня обыск. Доброе утро. В рамках текста в The new times. Телефон отбирают. — паша никулин (@mrzff) 31 января 2018 г.
They’re searching my apartment. Good morning. For my article in The New Times. They’re taking away the phone. The article in question, “From Kaluga With Jihad”, drew on an interview Nikulin had conducted with a Russian national from the Kaluga region, who went to Syria to fight for the Al-Nusra Front, a splinter faction of al-Qaeda. When it was published in March of 2017 in The New Times, the interview immediately drew the attention of the Russian authorities. Roskomnadzor, Russia's media regulator, issued a warning to The New Times for “signs of justifying terrorism” in the interview. The piece was later removed from The New Times’ website. Путин публично говорит о том, что тысячи россиян воюют за ИГ, а писать о мотивах, почему русский парень из Калуги принимает ислам и уезжает воевать в Сирию — это „признаки оправдания терроризма“! По мне так это классическая цензура, которая запрещена Конституцией. Putin publicly says that thousands of Russians are fighting for the Islamic State, but writing about motives, why a Russian guy from Kaluga accepts Islam and goes off to fight in Syria is “signs of justifying terrorism”! I feel this classic censorship, which is banned by the Constitution. — Хайн (@ian_hain) 31 января 2018 г.
They’ve just taken Pavel Nikulin for questioning, and look at how everything looks after the search. It’s immediately clear that they put some effort into it! They spent 8 hours. Confiscated three notebooks, a phone, documents, all the issues of moloko plus, all the t-shirts, pins, and stickers. — oDR (@opendemocracyru) 31 января 2018 г.
Мы за 15 минут отстрелялись по 51-й [статье Конституции], и дальше мне было велено завести новую симку, связаться с калужским управлением ФСБ и договориться, когда я приду на допрос. Возможно, мне уже на допросе отдадут большую часть вещей, но компы они дольше всего будут отдавать. It took us about 15 minutes to get through this once I invoked Article 51 [a constitutional guarantee against being forced to testify against oneself], and then I was told to buy a new SIM card, contact FSB's local directorate in Kaluga and set up a formal debriefing. I expect most of my stuff to be returned then, but they'll definitely hold onto my laptops longer. Although it was a relatively short ordeal, this sort of unprovoked interaction is indicative of the pressure that Russian journalists are sometimes subject to. To arrive at a journalist’s home and detain them several months later speaks to either gross incompetence in investigating criminal matters or outright extralegal harassment. Neither possibility bodes well for government accountability in Russia.